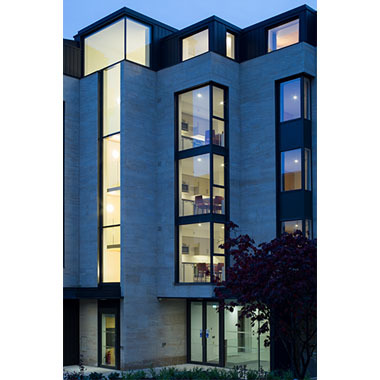 The new Hands Building at Mansfield College Oxford is the 3rd phase of an ambitious masterplan and estates development strategy developed for the college by MICA Architects. The building is formed of a 4-storey CLT structure above a concrete podium. The concrete basement and podium house a 160 seat lecture theatre and a new HQ for the Bonavero Institute of Human Rights, while the CLT structure above houses 74 student bedrooms with en suite bathrooms. 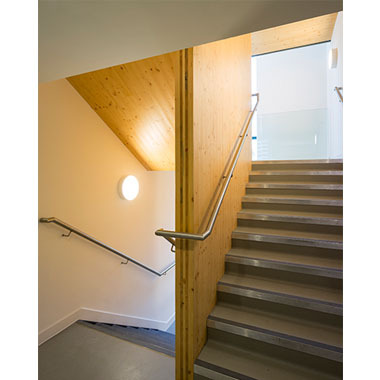 The bedrooms are accessed via a private, naturally lit CLT staircase featuring exposed CLT soffits and spine wall. Several considerations impacted the installation of the building including the site’s tight urban and Listed historic context including tree preservation orders and building in a site of archaeological significance relating to Saxon, Roman and English Civil War eras. This context result in restricted access for delivery vehicles and required careful logistical planning. The College remained operational throughout construction, therefore increased logistical planning was required to minimise disruption to the College and its neighbours. 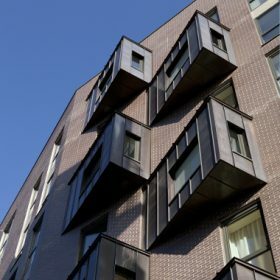 Eurban’s office team used advanced in-house BIM and DfMA capability to produce 4D simulation which enabled project sequencing and construction phasing to be rehearsed in the BIM environment. On site Eurban’s directly employed and highly skilled installation team were sensitive to the daily life of the college. 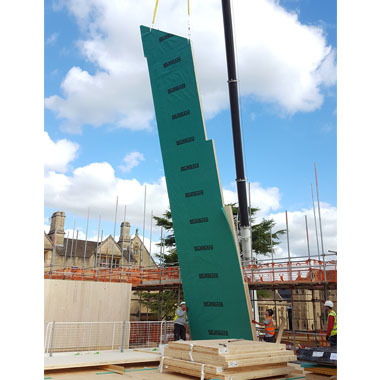 CLT enables ‘Just in time’ installation – the panels are lifted directly from the lorry into position, this methodology ensures a rapid assembly of the building elements on site. 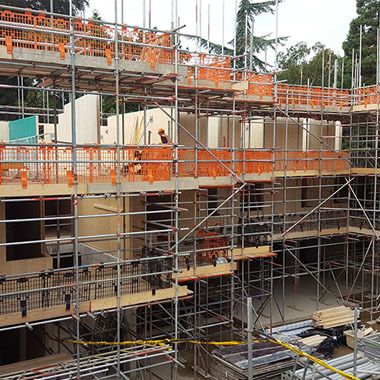 Eurban has always invested in maintaining a directly employed and fully trained, specialist installation team, which is unique within the CLT industry. Eurban also has directly employed in-house architects and engineers. The majority of Eurban’s installation team have been with the company for 5-10 years and are fully qualified apprentice-trained carpenters and joiners. 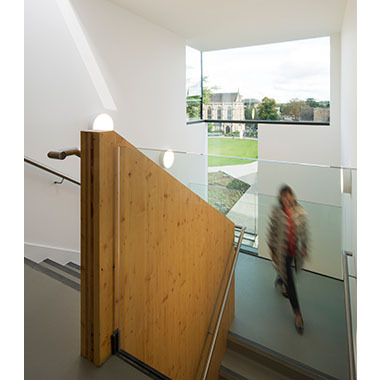 The site supervisor at Mansfield College, Paul Skinmore, started with Eurban as an apprentice aged 17. There are currently three apprentices in the business undergoing a four year training programme supported by Eurban. Direct employment of the workforce enables Eurban to operate a highly effective continuous improvement programme across the entire company. After every project undertaken by Eurban, the project team meets with the site supervisor to de-brief and look at the lessons learned. Information resulting from these meetings is precompiled and shared ensuring that knowledge from every project is retained and fed back into the next project. 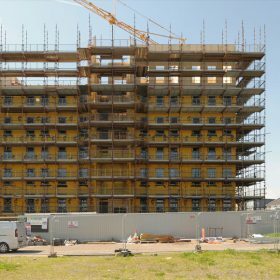 Eurban’s commitment to continuous professional development for all members of staff and to retaining knowledge and skill from one project to the next are some of the ways that the company guarantees high quality results, not only continually raising its own standards but setting a benchmark for the CLT industry.